This guide was built using Microsoft Visual Studio 2005, which includes Visual C++ 8. Also works for Visual Studio Express Edition. You can also create a "Console application", and whenever you execute your application a text console will also be displayed. This is a very useful situation so you can the use standard C printf functions to display textual information for debugging purposes. 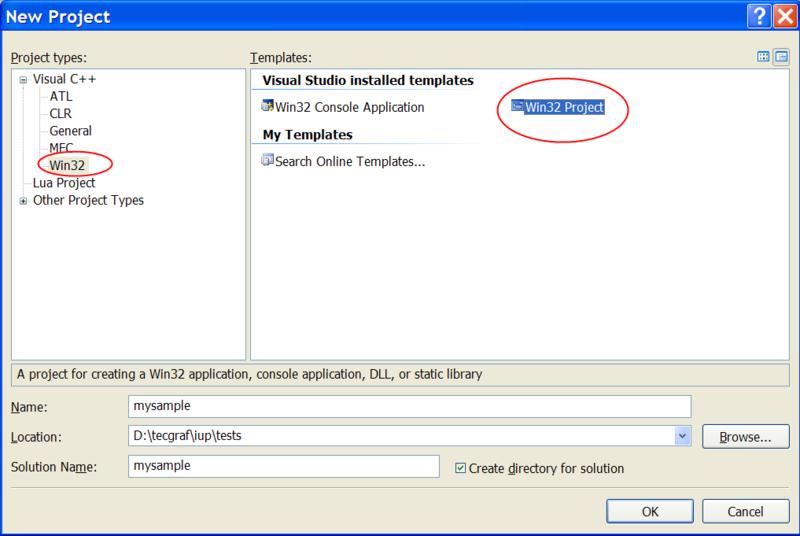 One is in the menu "Tools / Options", then select "Project and Solutions / Visual C++ Directories". Select "Include Files" or "Library Files" in "Show directories for:". 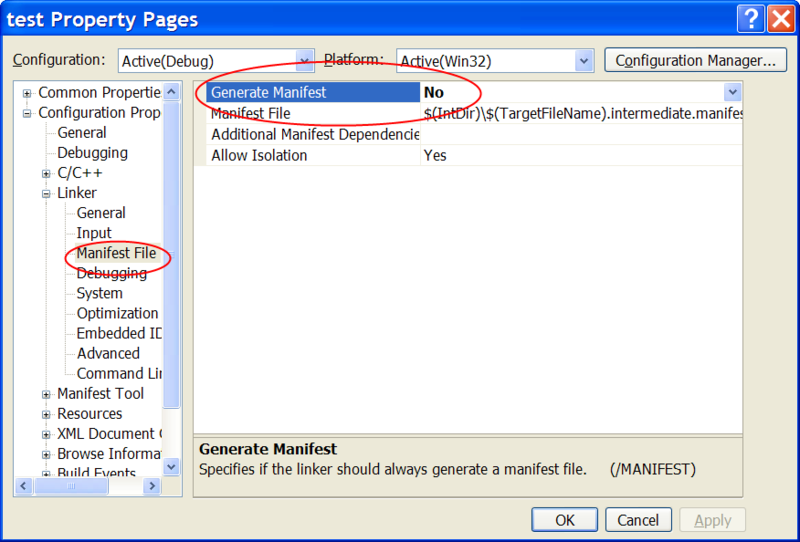 In this dialog you will configure parameters that will affect all the projects you open. Or you can configure the parameters only for the project you created. In this case go the menu "Project / Properties". 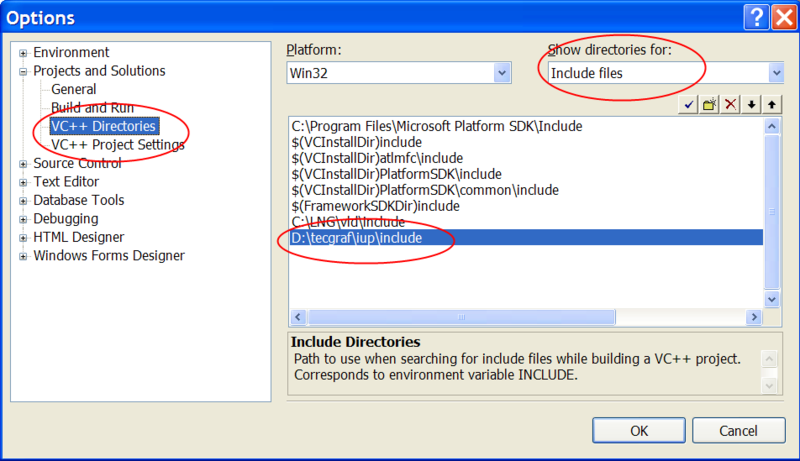 To configure the include files location select "Configuration Properties / C/C++ / General" in the left tree, then write the list of folders separated by ";" in "Additional Include Directories". To configure the library files location select "Configuration Properties / Linker / General" in the left tree, then write the list of folders separated by ";" in "Additional Library Directories". Now you must add the libraries you use. 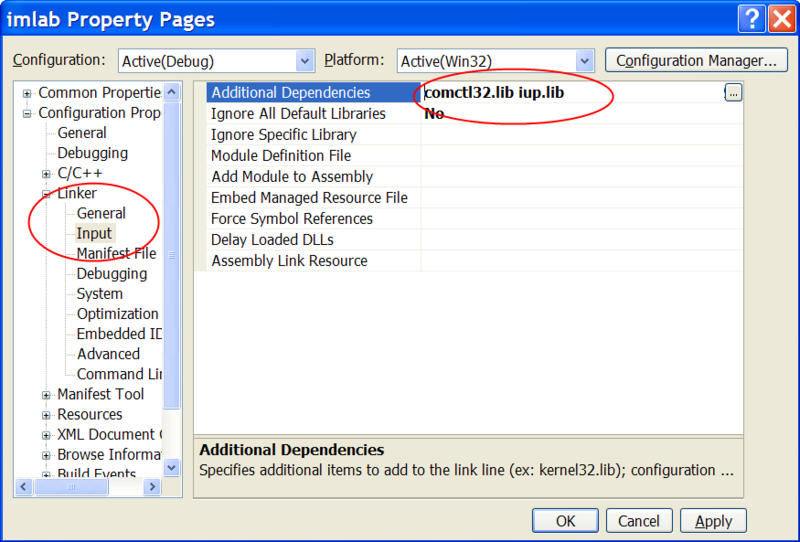 In this same dialog, select "Configuration Properties / Linker / Input" in the left tree, then write the list of files separated by spaces " " in "Additional Dependencies". 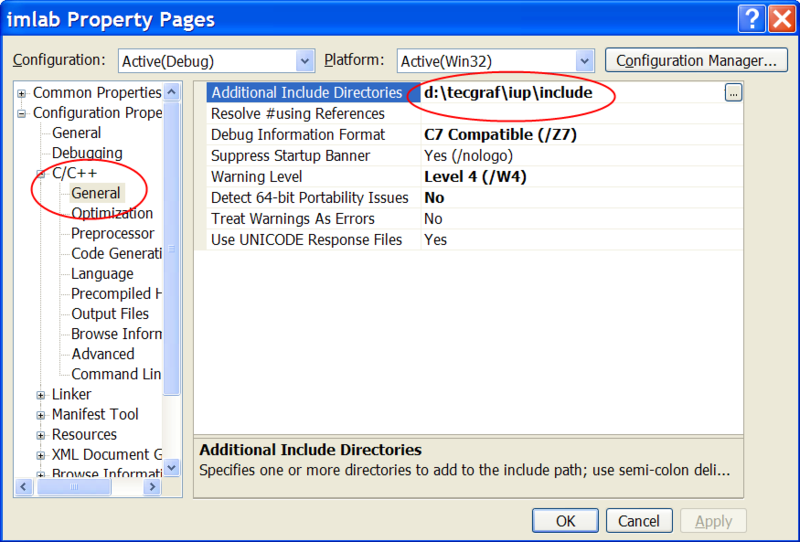 The default configuration use the C run time library with debug information and in a DLL. 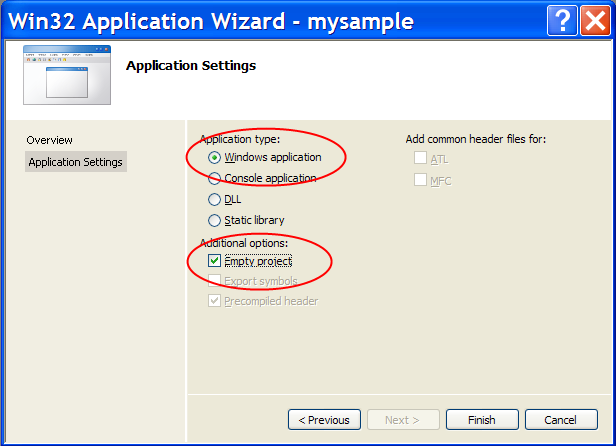 The standard IUP binary distribution has two packages for Visual Studio 2005 (or Visual C++ 8). Both do not have debug information, but this could be ignored even if a warning appears in the Output log. To change your project properties go to "Configuration Properties / C/C++ / Code Generation" in the left tree, then change "Run Time Library" to match the IUP binary package you are using. The "vc8" package includes static libraries without debug information. So to match this package configuration you should select "Multi-threaded (/MT)". 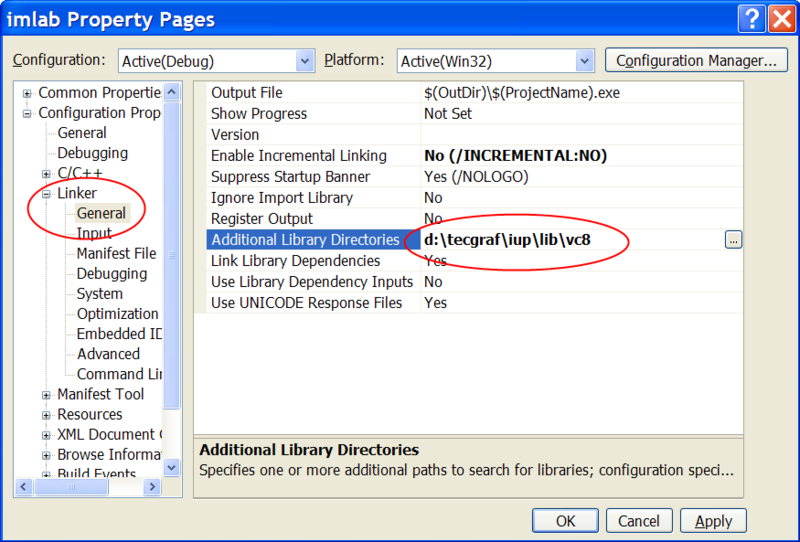 The "dll8" package includes dynamic libraries without debug information. 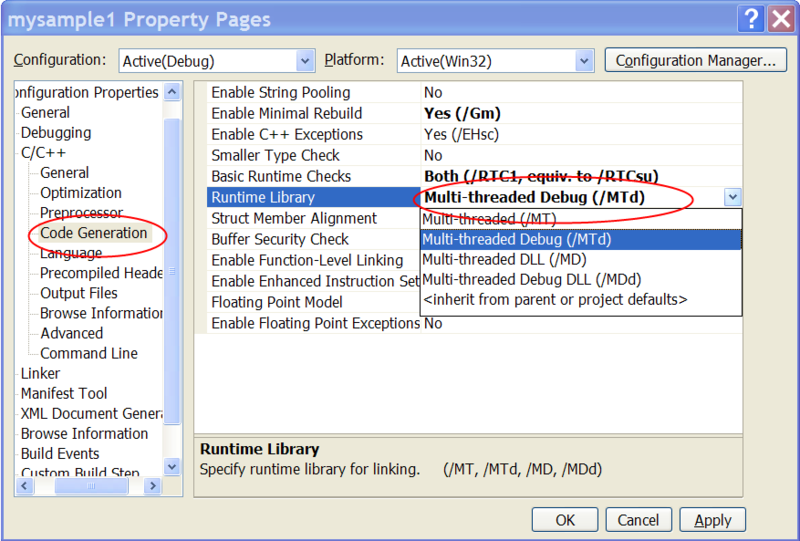 So to match this package configuration you should select "Multi-threaded DLL (/MD)". When using the "iup.manifest" from "iup.rc", configure the linker properties of your project to do NOT generate a manifest file or the Windows Visual Styles won't work.